It dawned on me, as I read Atomic Habits (Amazon, non-affiliate link) and Fisher’s 2012 version of the change curve, that the dip in Fisher’s change curve is driven by identity. How does the change challenge your identity? 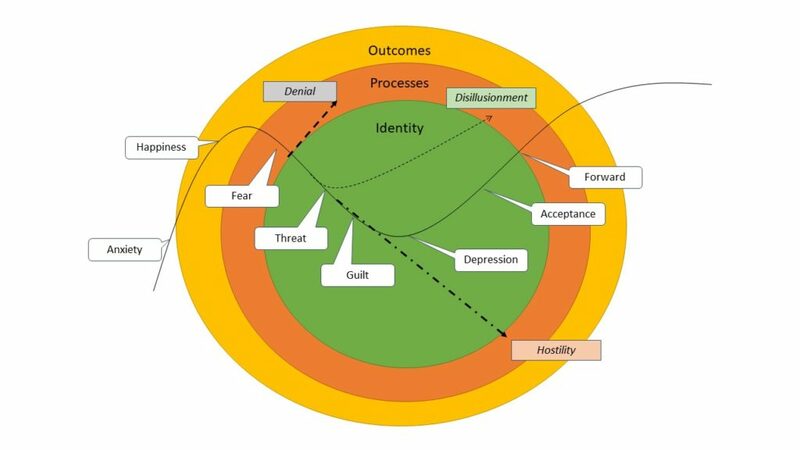 Fisher speaks to this in his 2012 paper, but I think we underplay the emotions and the threat to identity involved with ANY change. This is particularly true in the corporate environment, where we assume people are cogs and remove the variable of identity. Over many implementations, I’ve observed repeatedly that something as simple as an applications upgrade can derail due to threats to identity. Someone who has proudly created an effective process in the old tool resists because the implementation team inadvertently threatens their identity as a “creator” and “designer” (even if they don’t use those exact terms) as we try to encourage new ways of working. Even with self-inflicted change, we can feel this emotional resistance to threats to our identity. The “new me” wants to be peaceful. The “old me” wants to continue being clever and snarky. I’m not sure what peaceful looks like. My environment rewards clever and snarky. My environment expects me to be clever and snarky. So now what? Finding the answer to that is the journey. Do I continue trying to be peaceful and restrain my clever snarkiness? Do I use the clever snarky voice in my head as a mindfulness exercise? Do I decide that peaceful is an unrealistic identity for me and abandon the effort? This is where having a strong “why” comes in handy. Fundamentally, all change and learning asks who you want to BE. Be clear on the answer. Be clear why you want to be this new person. Be clear on how this new person is going to engage with the world. You won’t make it through the change curve without this.